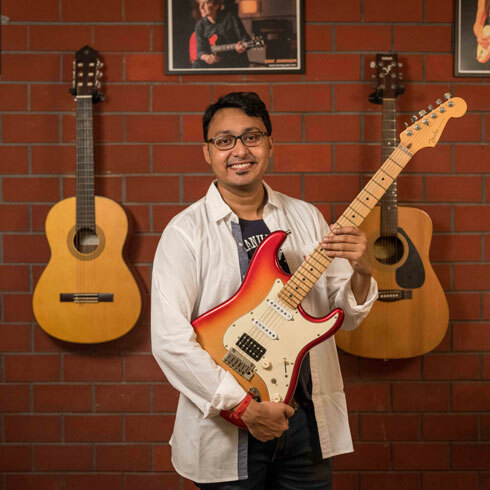 Tamsguitar is an initiative by Tamal Ghosh, a guitar player and teacher to help beginners learn guitar at ease as a hobby and also to help serious guitar players with proper guidance to pursue music professionally. Styles taught Blues, Rock, Fingerstyle, Funk, Country, Improvisation, Western Classical, Metal etc. The motto is to make guitar lessons accessible to all. Whether it is through online tutorials in Youtube for free, face-to-face classes in Pune or Kolkata or even long distance lessons via Skype (U.K. U.S.A ,Canada,Australia etc )– Tamsguitar aims at inspiring people to take-up and explore the art form of guitar playing. The approach to teaching is systematic and well thought out, but is not a ‘one method suits all’ one. Here, an individual or group is taught in a way that enhances their learning process guided by a team of professional musicians. Our youtube channel with 550+ tutorial videos has helped innumerable guitar enthusiasts to learn songs and concepts for free. If you failed and quit many times before and lost hope then you are the one we are looking for.